We started TickTock in March 2017, knowing that robotics was about to have a breakthrough, and it was going to start with mobility. Soohyun Bae and I both met at Google years earlier, and had worked on augmented reality products. Soohyun went on to Magic Leap, and I helped launch Project Tango, now called AR Core. We both knew that AR’s push for mobile 3D mapping and scene understanding was causing a dramatic tech shift that would also benefit robotics. You’ll see hints of how that tech comes into play down below as we share TickTock’s explorations into consumer robotic product opportunities. Our initial goal was to make the simplest robot possible that solved a real problem for users. First we had to set our team’s expectations for what’s technically possible and what user experiences were already available. 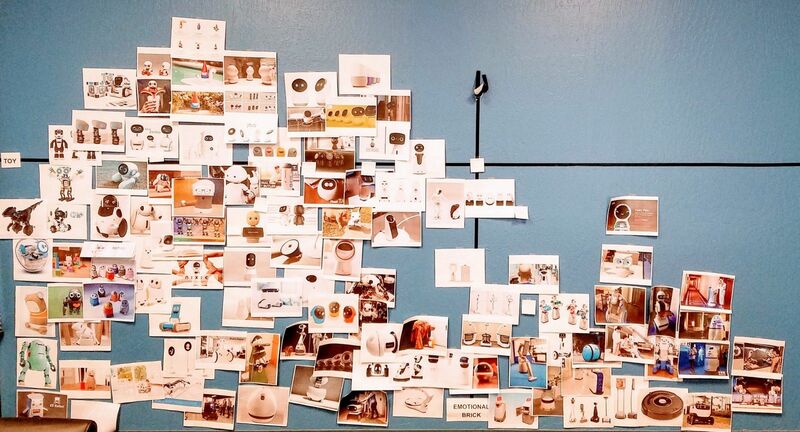 We put up pictures of dozens of robots on the wall and looked for commonality and trends. Wall of robots for inspiration and market understanding. A super smart robot was going to cost hundreds of dollars so we really needed a user experience with enough utility to justify the purchase. It was likely going to become a new category since nothing like it existed out there. We were honest with ourselves about being a hammer looking for nails, in that the product had to justify being a “robot” (sense > plan > physical action > learn > repeat) and also match our individual backgrounds and passion. That’s where mobility kept shining through. Moving things, whether household items or just a suite of sensors, is something a stationary IoT gadget can’t do. We move stuff all the time in our lives, and our possessions can’t be everywhere at once, so we started with a simple point-to-point mobility robot. The original industrial design for the TickTock Slider. We called it Slider, and it was “Kiva Systems for the home”. It would come with the tagline “your home, on demand” (hat tip to Donovan Bass on that one). TickTock Slider coming out of its packaging like a new pet coming home for the first time. The box would include two small plastic stands for commonly accessed items in the home to sit on. This would allow robots to drive under them, lift the item up, and bring it to you (or put it away). Products like trash cans and laundry baskets could be designed with a few inches of space below them for robots to move them any time. Could having laundry and trash receptacles nearby at all times prevent clothes and trash from landing out of place, thus preventing the need to tidy up as often? Imagine a laundry basket that knows when your kids come home from soccer practice and places itself right where their uniform would normally hit the floor. Existing laundry baskets could go on small stands or new designs would emerge that were meant to be moved by robots. Imagine an entire aisle at The Container Store full of shelving and baskets with space underneath. Picture waking up on trash day and all the cans are right by the door for you to dump into the bin and take to the curb — then returning the empty cans room by room after you head off to work. Trash and recycling bins could be designed for robots or existing cans could be placed on small plastic stands included with the robot. Beyond static plastic, we felt that an ecosystem of accessories might become possible thanks to a power port on the back. The Essential phone does a nice job of this with two pins and magnetic docking. Two pogo pin contacts to power accessories would be on the back. This could enable a wide host of utility that reuses the presumably expensive parts in the mobile robot base. This addresses the fact that “general purpose robotics” doesn’t jive with real world physics, and recognizes that even dexterous humans have drawers full of tools and utensils to help us get work done. Robots too will need physical affordances to interact with the world and accessories can be purpose built for specific tasks. An array of powered accessories would be brought to life when TickTock Slider docked with them. Who knows, maybe people just want faster access to beer? A slide-out tray for a cooler on the ground is way more practical than a robot arm trying to reach behind the milk in your main fridge. Robot arms are expensive and not reliable yet so why not slide out a small tray and turn storage systems into dispensers and vending machines? The breadth of the above use cases was the problem though. There’s too much reliance on accessories for a startup to break through. Investors kept asking us “what’s the one accessory that most users will buy?”, and suggested we make that as a fully integrated solution. Our user research showed strong opportunities for an “Echo Show on Wheels” device (which I talk about here), but investors knew that was Amazon’s job and we had to be different. The accessory that we found most traction with was in cleaning. It’s a daily task and a pain to constantly fetch supplies, especially for families with kids making messes five times a day. Slider accessories evolved from bringing brooms and dustpans to fetching Dyson vacuums. Then it became an entire cleaning system with spray bottles, paper towels or wipes, and a trash bin. The removable hand vac was always within arm’s reach. The Slider use case for cleaning started with the idea that we’d just go fetch a broom and dustpan. Users reacted with “ hey, it’s not the 1950’s, I need my Dyson”. So we looked at transporting a handvac (whether from Bissel, Dyson, or Hoover), but found that people keep them in closets. This kept them out of sight but also out of reach for a robot to go fetch (opening doors was out of scope). This meant we needed something attractive enough to remain in a common part of the home, ready to make itself available when needed. A removable hand vacuum, or 2-in-1 vac, would need an entirely new design from the circular or D-shape floor vacs on the market today. Additional user feedback suggested we add cleaning supplies so people could fully handle any mess, not just vacuum the floor. Busy families loved the idea of one-handed cleanup, especially parents that frequently have to clean up both dry crumbs and wet spilled milk, often with a baby in one arm. Slider’s contextual AI would learn when it was needed (e.g. after 7am breakfast on weekdays) and come clean up any messes on the floor. You’d have quick access to a handvac if there were crumbs in the chair, plus wipes and a trash bin for other messes (e.g. the oatmeal my kids ALWAYS miss getting in their mouth). Pixar got a lot of things right in Wall-E. The robots were purpose built and knew when they were needed. M-O brings attitude to floor cleaning and keeps working until the floor is spotless. The contextual relevance of knowing where and when to be was key to addressing a major complaint with current robot vacs: they aren’t there when you need them! This brought up a new issue though. If a robot is going to be roaming around all the time, it needs to fit in among the family. There are tons of videos online where both kids and pets freak out when Roomba is active, so we needed better HRI (human robot interaction) and a friendly design. The industrial design for the TickTock Sir-B added a rounded head for increased comfort when working around people. It could still clean the floor and had a removable vac. My daughter Lily came up with the name, which started as “mister robot”. This wasn’t a vigilante hacker, so “Sir Robot” became “Sir-B”, a cute and approachable floor cleaning tidy bot. A “San Francisco Millennial Mom” is feeding her child while the TickTock Sir-B cleans up Cheerios on the floor. The “Mom” persona was featured prominently in our user experience designs because she still does the majority of household chores. We didn’t plan to have Sir-B talk, but it could play songs and move in fun ways to gamify cleanup activities. Toddlers respond to the Barney Cleanup song like Pavlov’s dog and instantly start cleaning things up. Kids learn to make chores fun in preschool and our testing found they responded well to robots moving silly and playing fun songs. It’s unclear how long that would last but the robot also had the power to turn off WiFi (on compatible routers) and turn off the TV (for service providers with a developer API). You’d also get piece of mind when away from home by keeping an eye on things. Pets, people under care, or just checking if that pesky stove was left on. Sir-B is cleaning up spilled food while a dog eats from a plate. Many pet owners said they worry about their animals while they are at work all day. Communicating verbally to them through the robot was also of interest. Wait, isn’t robotic floor care a saturated market? Yes, there’s so many robot vacs out there that price competition is fierce. Incumbents like iRobot also have huge market share backed by vast distribution systems. While we felt strongly that users were craving a Sir-B-like product, we’d still have Roomba on the retail endcap and our robot would be halfway down the aisle on the bottom shelf getting no attention. Investors wanted nothing to do with it. Thankfully we had Bryan De Leon, an amazing Industrial Designer and User Experience Researcher, working with John Moretti, an experienced consumer electronics Product Manager, who both iterated rapidly on new ideas. Their user studies and market research led us to drop the vacuuming but keep the fun cleanup aspects. We explored many different industrial designs for a mobile transport system. There was a mix of material options to fit naturally in a modern home in addition to varying degrees of “cuteness”. Peel back everything physical beyond mobility and you’ve got a super smart toy basket and interactive cleanup pal. Imagine age-relevant games to make kids feel like they’ve got support and motivation to tidy up. Concept video for TickTock Tidy, the home robot that encourages kids to be responsible for cleaning up their things. It did this through age-appropriate gamified app experiences using motion and sound. Parents in the Silicon Valley bubble loved it! Even at $700 they were thrilled at the idea of delegating some nagging to a robot that encouraged responsibility in their kids. Got teenagers who don’t listen? The robot will cut off the TV and WiFi until all out-of-place objects are where they belong. This is where we ran into the downside of being in Silicon Valley. The bubble only extends so far and investors felt this product had no chance working across the US, let alone the globe. For that price point it had to do more! Uncolored designs for the TickTock home butler concept. Users would empty their pockets onto the top tray when coming home so keys, wallet, glasses, and phone could be accessed any time on command. A large mount for a tablet with wireless charging allowed video chat using the video provider of choice. One of the highlights of my time with TickTock came in meeting Nolan Bushnell. He’s equally known as the founder of both Atari and Chuck E. Cheese. My very first job in high school was as “Gameroom Technician” for the Chuck E. Cheese in West Palm Beach, FL, and of course Atari got me hooked on video games. Many thanks to Vijay Sundaram for the intro! TickTock’s UX lead, Bryan De Leon, poses with Chuck E. Cheese and Atari founder, Nolan Bushnell, after a fun user experience conversation at the TickTock office in Santa Clara. The silliness infused in some of Nolan’s playful ideas left us smiling for days. Lesser-known is Nolan’s breakthrough home robot efforts. He’s one of the few people to have shipped millions of dollars of mobile home robots and Androbot did it long before the benefit of modern mobile processors. His passion for fun and play are infectious and we tried to embody some of that in our next concept — the TickTock Butler Robot. Concept video for the TickTock home butler robot. It maps a new home and then autonomously navigates to specific locations on command. Users loved the idea of remote mobile video for peace of mind and wanted to see more fun games for kids to stay on task. The robot would let you keep an eye on things when you weren’t home. It would hold or transport commonly accessed items. Your kids might even be nudged into picking up their toys with a reward system set by the parents. Of course we’d put the Google Assistant and/or Amazon Alexa on it as well for quick access to information in any room of the house (one robot per floor). The inside of the TickTock butler robot would essentially be parts commonly found in electric skateboards and AR capable smartphones. The rest is inexpensive plastic. TickTock focused a lot on UX with voice, touch, mobile, web, and augmented reality modes for interaction. It needed to explore your home like a new pet and autonomously make a map right out of the box. Unlike a slow moving floor vac, it needed to respond quickly, which required powerful vision systems to move safely at speed. Many of the ways to interact with the TickTock robot. Voice commands were the lowest friction and most common, while augmented reality allowed for high fidelity setup and training. 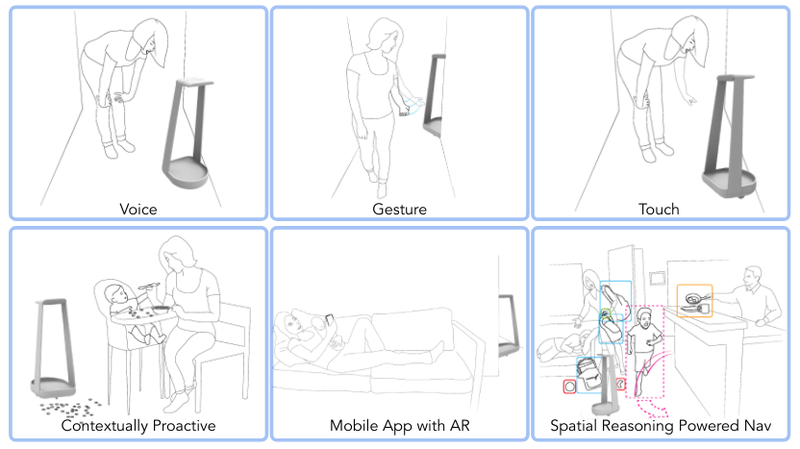 Setting up the robot and “training it” is uniquely suited for mobile augmented reality. We discovered that users didn’t require any training to simply point their phone at various locations and objects in your home to label them. From there we found that voice was the quickest way to command the robot, so we supported both Amazon’s Alexa and Google’s Assistant. Our AR app was called ARRViz (pronounced like a pirate, “arrrr-viz” was a play on ROS’s RViz), and stands for the Augmented Reality Robot Visualizer. We found it to be super handy to see what the robot was thinking and how it viewed the world. Two minute highlight video of using mobile augmented reality and voice interaction to train and control a mobile TickTock robot. The TickTock software ran on the Asus Zenfone AR mounted on top of the Kobuki base. With an Echo Show mounted on top we got onboard voice recognition and video telepresence for free. Here we can see it roaming the TickTock offices with one team member remotely dialed into the Echo Show from his iPhone’s Alexa app. An afternoon hack led to us mounting an Echo Show on a Kobuki to try mobile telepresence and onboard voice. It’s not clear which of the ideas above will take off first, but I suspect all of these products will exist some day. My family certainly had fun experimenting with them, even in their early unfinished state. 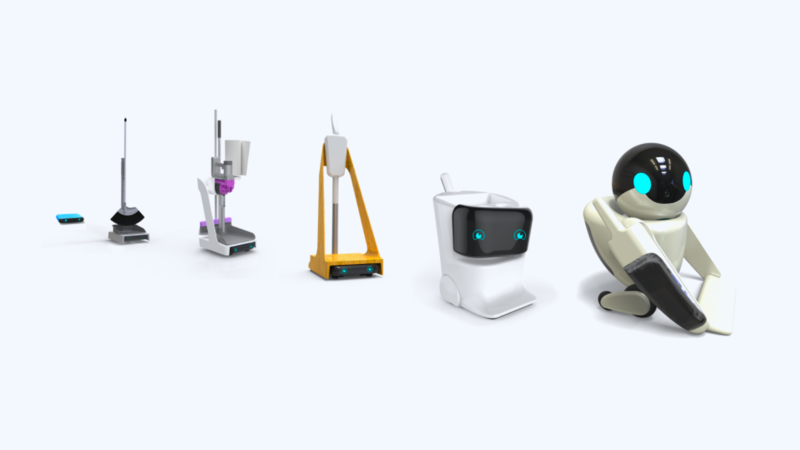 The evolution of TickTock robot concepts from Slider to fully integrated cleaning inspired by M-O from Wall-E. Timing has to be right for the tech to be mature, the price to be affordable, and users have to be willing to embrace new experiences. Augmented reality tech as used on the Project Tango Asus Zenfone AR definitely showed a viable path to autonomous navigation. Unfortunately, nearly 200 investors felt that 2017 wasn’t the right time for a startup to break through in this space on cost and market readiness, so all of these ideas had to be shelved. TickTock pivoted to commercial robot opportunities in 2018, and I’ll share those product concepts soon. We’ll still be cheering on the consumer robot sidelines for Keecker, Kuri, Misty, Temi, and whatever Amazon is cooking up to succeed! Ryan Hickman (@ryanmhickman) started at Google in 2007, and co-founded Google’s Cloud Robotics group in 2009. When Google acquired Motorola, Ryan worked on Project Tango within Google’s Advanced Technologies and Projects group, and most recently was supporting an effort to explore new hardware device opportunities for kids and families. In 2016, Ryan joined the Toyota Research Institute as an early member of its Product team. Ryan cofounded TickTock AI in February of 2017 to apply a new approach to AI for mobile apps and physical devices, and is currently the CEO. More of Ryan’s writing is available on Medium.